Last month we had about 10 people join us for our first “Work and Learn” day to build compost bins and clean up the garden. We had some great questions from gardeners and teachers alike. 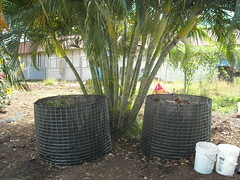 See the Garden Tips article on composting to see the bins that were built. We’ll be continuing our garden cleanup. We are working with the school to address irrigation issues but until they get fixed we have weeds! Bring your gardening questions and we’ll try to help. Please dress in comfortable gardening clothes and closed-toed shoes, a hat and apply plenty of sunscreen! We’ll provide some snacks and water. Please bring your own cup or bottle. We ask that you let us know if you can make it so we know how many to plan for. New volunteers from the community are always encouraged to come join us so even if you can’t make this event, let us know you are interested. Call Nio at (808)280.5308 or email nio at southmauisustainability dot org. 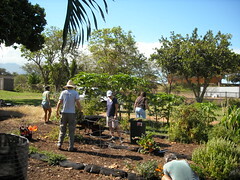 Grab your farm curious friends and family and join us for the first community work morning at weFarm@kapalua . Help us move the farm forward while meeting your neighbors and local farmers. 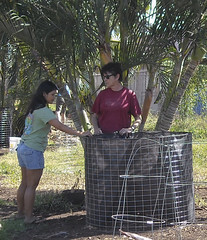 learn our vision for a more food secure Maui, and find out ways to be engaged. We will meet at the office at 8:30 A.M. and vanpool to the farm. The office is located at the corner of the highway and Napili Hau St. across highway from Napili Plaza. Together we will work through farm tasks assigned by farmer Dan. Around 11:30 A.M. we will wrap-up in the field and head back to the office for a potluck lunch. Bring: long pants, a protective top, gloves (if you have them), sturdy shoes, sun protection, a water bottle, a dish to share for lunch and lots of energy. RSVP toinfo at uluponosustainable dot com. Reply early as space is limited. Do you know what the quality of the water is in which you are diving, swimming, snorkeling, surfing, or fishing? The boys and girls at Kihei Youth Center know! We had about 20 students participate in training and sampling exercises. Maui Dreams, South Maui Sustainability, the Maui Nui Marine Resources Council, and the Hawaiian Islands Humpback Whale National Marine Sanctuary are working together to bring the Turbidity Task Force to the Kihei Youth Center, schools, commercial operations such as Maui Dreams, and anyone else who wants to get involved. The Hawaii State Department of Health (DOH) has just one person monitoring Maui water quality here. He has many other other responsibilities too so there isn’t much monitoring being done. 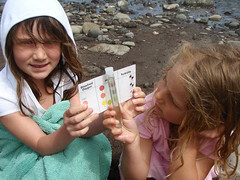 This inspired us to create water sampling kits with simple instructions that allow anyone to assist in gathering information about the quality of our water. You might be interested to know that the Kihei Youth Center group found that turbidity (cloudiness) of the ocean water in North Kihei was generally better than what the DOH standards mandate with just one high sample. It is important to do recurring and regular sampling to see when changes occur of observe gradual changes. Anyone can stop into Maui Dreams, pick up a kit, receive about a minute of instruction, then off you go to get a sample from your favorite beach! The results are entered into an online database for future viewing and analysis. If you have any questions about this fun and important program please ask for Teri at Maui Dreams Dive Co. or email her at teri at southmauisustainability dot org. 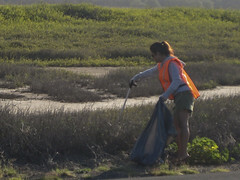 Mahalo to everyone who took time out of their busy lives to help with our quarterly beach clean-up at Kealia Pond National Wildlife Refuge. We had a good turnout. It feels good to spend a couple of hours of time each quarter to get out there and make our home a better place to live. A special thank you to Community Work Day for their great support in providing the tools to make the job easier and for picking up the filled trash bags. One of the things that come to mind as we are picking up trash is that no one is free of the responsibility of creating litter. We find trash from every possible source. We see items from retail and food establishments, medical facilities, construction companies, and non-profits as well as everyone else. Of course, the amazing thing we find is that even in this dry, dangerous season, we find hundreds of cigarette butts which were obviously thrown out of the passing vehicles. It is not surprising that we have terrible fires each year. I hope to see you again next quarter. Contact teri at southmauisustainability dot org for more information. This month, our habit of the month is Composting. Composting is easy for almost everyone but if you don’t have a garden (or a friend with a garden) you won’t realize the return. Compost is gold for any garden (even containers) and you don’t have to do much at all to create great compost. Composting prevents tons of material from going to the landfill that is specially designed to NOT decompose. The first thing you need is a covered container to keep your food scraps in before you take them out to the bin. The size depends on how much food scraps you create and how often you want to take them out. Don’t use any meat, oil or dairy products to avoid getting pests. Dead and dying remains of fruits and vegetables, coffee grounds, egg shells any paper products that are biodegradable can be added. The second thing you need is a compost bin, pile or vermiculture setup. Bins can be purchased at almost all garden stores or made with just simple material. See the Garden Tips section for information on building a outdoor bin like we built at the school garden. There are literally hundreds of websites and videos on composting. Some make it sound like rocket science but don’t worry … compost happens! Getting better at it just means you can create compost faster. Essential ingredients are green stuff (food stuff from your covered container, grass clippings, green leaves), brown stuff (dried leaves, small stems, cardboard), air, water and compost or soil starter. As you build your bin, layer these. There are tons of different “compost recipes” but unless you are measuring dry weight (I’m not drying out my garbage!) most are overwhelming. Keep a relative mix and check out how things are going by turning. If you turn your bin every week or so, that introduces more air and the process goes faster. Add a little water if it seems dry. Just remember that anything you do will speed up the processing … if you don’t do anything, compost still happens! This column highlights little changes toward a more sustainable life. Each month we feature one small thing that you can do each day in just minutes. You may already be doing it so find ways to adapt and improve. Studies show that it takes about 20 days to establish a habit. By having a habit of the month, we are constantly establishing more sustainable lives. We’re all about composting this month. In this article we’ll discuss the different types of composting (hot, cold, vermi-composting) and how to build your own compost bin(s) for very little money. We spent about $35 to create 3 bins. At our last work and learn day, we had several people asking about whether their compost is “hot” or “cold”. Well that depends on how well you treat it. Ideally, we would all have “hot” bins. The material in a hot bin gets hot enough to destroy weed seeds, insects and most pathogens. It can also get “hot” enough to spontaneously combust if you have too much dry browns so be careful! In a hot bin, the temperature can exceed 160 degrees Fahrenheit but above that, you’ll start killing the great organisms. If you find your bin getting super hot, just turn it more often. To have a true hot bin, you need to have a large cubic foot area at least 3′ x 3′ x 3′. A hot bin will create compost in just weeks. Most home compost piles are built gradually where you add things from the garden and garbage. You fill it up and then it starts breaking down. The center will always be hotter than the outside so it is important to keep turning. Either put weeds in the center where they’ll get hot or toss them in the garbage. If you are a lazy gardener and rarely turn your pile, the outsides will continue to be unbroken down and filled with bugs. If your bin is smaller or never really fills it will tend to be cooler. A “cold” or “warm” bin still brings much biological activity that builds great compost but may need more filtering. You don’t want to put any weeds or pest infected debris in a cold pile because you’ll just be creating more problems. Vermicomposting is usually smaller scale and uses worms to create wonderful compost. You could keep your worms inside or in a cool shady spot outdoors. This could be a whole article on it’s own! To make the great and super easy compost bins like we did, just buy a roll of galvanized 36″ sturdy wire. Buy sturdy landscaping fabric that is at least 36″ long. Cut both the wire and the fabric into at least 10′ lengths to make a 3′ diameter bin. Make sure that there are no sharp or pointed wires sticking out. You can either use wire, twine or zip-ties to fasten the ends together. Just remember that you want it secure but easy to cut when you are ready to process your compost; just cut the ties and unwrap the pile. For those who like to build, try building a square top for the compost bin that doubles as a compost sieve using 2x4s and 1″ wire mesh. Share your composting tips below!